Yes, he's my little buddy, sweet Spaatzie aka Babyman. I think most dachshund owners have their own Gilligan. The little buggers devote themselves to someone, if your lucky its you. My husbands "little buddy" is Foozer. He is daddy's boy. I often tell him he has some weird shaped shadow.Fooze often cries terribly when Jerry leaves. Spaatz just wants us to be permanently attached. He has the ability to defy gravity, and ends up in my lap without any effort. Peaches is also partial to me, but a part of her will always love my daughter. I have a theory that I have observed to be true to several dogs we have had, not just the dachshunds. Whomever lap they ride home in that first time they ever come to your house is their person. It is true with all my dachshunds and even a doberman I had years ago. 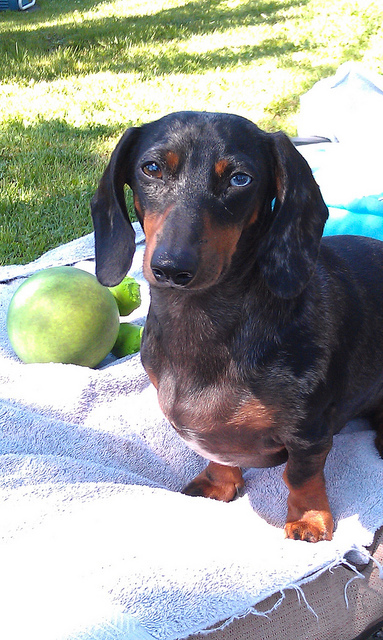 Do you have a Stubborn Dachshund?